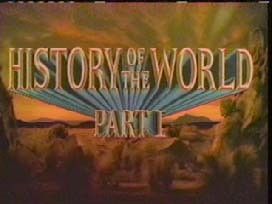 Mel and his gang travel through the history of human civilization, providing a different point of view to famous events. A new look at the Moses, the Last Supper, the Roman Empire, the Spanish Inquisition, and the French Revolution. The song 'Jews in Space' has the same melody as the song 'Men In Tights' from Robin Hood: Men in Tights. Richard Pryor was originally cast in the part portrayed by Gregory Hines, but had to replaced because of his famous drug accident, which resulted in him being severely burnt.